Princess Madrun was the eldest daughter of King Vortimer Fendigaid (the Blessed) of Gwerthefyriwg (BS). She was probably named after the Romano-British mother goddess, Matrona (DNF). Madrun had married Prince Ynyr, a descendant of the Emperor Magnus Maximus, at a young age and, together, they ruled the Kingdom of Gwent after her father’s death. She was one of those present at her ageing grandfather Vortigern's last stand and was forced to flee his burning castle of Tre'r Ceiri, for safety in the nearby fort on Carn Fadrun (LBS). Later, while on a pilgrimage to Ynys Enlli (Bardsey Island), Madrun and her handmaid, St. Annun, stopped for the night at Trawsfynydd. Here they both had an identical dream in which they were commanded to build a nunnery where they slept. Amazed by the co-incidence, they did as required and the church there is dedicated to them still (Foulkes 1870). 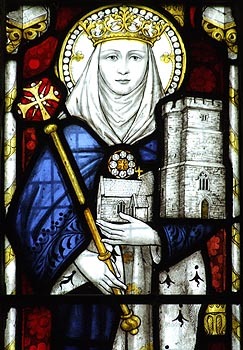 In later years, Queen Madrun settled in Cerniw (Cornwall) with her son, St. Ceidio. Together they evangelized the area around Minster, and it was here that St. Madrun eventually died and was buried (Spencer 1991).